INFINIT Nutrition was started 15 years ago by a group of guys that were multiple IRONMAN Kona finishers, and has operated primarily as an endurance hydration and fueling company since its founding. 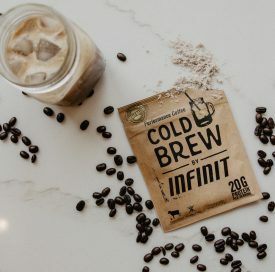 The launch of COLD BREW is a continuation of the company’s diversification and expansion into the premium protein and recovery market, and it joins their Performance Café line, alongside the popular MUD pre-workout and meal supplement. INFINIT Performance Nutrition specializes in providing customizable nutrition-solutions that naturally maximize the performance of athletes worldwide. INFINIT’s unique customizable system gives athletes the ability to design their own sports fuel formulas, made with all-natural ingredients, to their exact specifications. Developed with the patented Osmo-FITTM system, INFINIT products and formulas are designed to be isotonic and easy to digest, even in the most grueling conditions. For more information about INFINIT Nutrition, visit infinitnutrition.com or on social media @infinitnutrition.